Sooooooooo if you recall I had a few things to say regarding The Planet of the Apes series from a previous article. Well, as it so happens I realized the other day that I had to see Rise of the Planet of the Apes for sheer completeness’s sake. So I saw it. Rise of the Planet of the Apes was seen by me. For my immediate thoughts on the film kindly enjoy the following paragraphs. Directed by Rupert Wyatt in this year of our Lord 2011, Rise of the Planet of the Apes is an effective redux of the original’s third sequel, Conquest of the Planet of the Apes (1972) which deals with the ape revolution. It is also quite easily the best Apes movie since the first Planet of the Apes in 1968. Rise features some impressive special effects, compelling characters, exhilarating action, and some truly fascinating motion capture performances (the main character of Caesar being performed by Andy Serkis who is definitely going to start getting a reputation for this sort of thing after Gollum and King Kong). Rise, however, is by no means a perfect movie. My main beef with Rise comes from the cold simple fact that the filmmakers are so preoccupied with conveying a believable and complex ape plot that they forget about the humans. I go into a movie like this not expecting to buy every pseudo-scientific detail spewed at me, but I would have liked it better had a little more care been placed into the human storyline. James Franco (Pineapple Express) does an OK job as the stereotypical good scientist with ambition who winds up taking care of Caesar, but the role never calls for much and we lose track of him and what his goals actually are before the halfway point. John Lithgow (Third Rock From the Sun) is back on the screen as Franco’s Alzheimer’s afflicted father, but again not much is given to him. The gorgeous Freida Pinto (Slumdog Millionaire) is the biggest loss. She is essentially a wasted character entirely. She provides nothing to the story except its basic need for a female character. Literally nothing she says or does is important in this movie (BECHDEL TEST). She is so woefully underwritten that it makes me very sad indeed. Brian Cox (25th Hour) has the most interesting human character as the ambiguous “monkey jail warden,” but he’s given very little screen-time and most of it comes down to what he can do with very little. His animal-hating son is played by Draco Malfoy himself, and I certainly hope that he gets better work in American films after this. David Oyelowo (The Last King of Scotland) plays the final piece to this cliche-wrought puzzle: the greedy rich guy who controls the apparent progress of science. I found all of these fine actors wasted here. It begs the question of why you would cast big names for stock roles that could be played by anybody? I think had they spent a little more time developing the human world (and maybe casting it a bit more along the lines of District 9) it could have saved much for me. 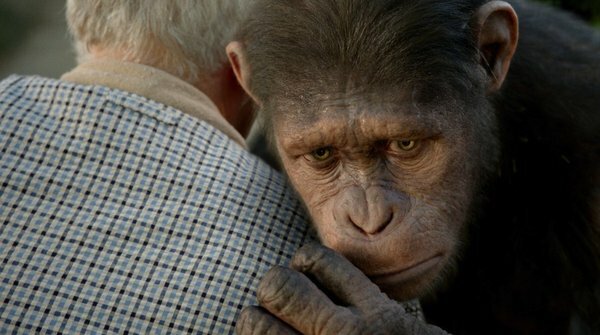 All this aside, the only real reason anyone is going to see this movie is for the apes. This department delivers. With almost no dialogue the CG apes provide an incredibly emotional and nuanced narrative that is hard not to be sucked into. Caesar (the name obviously a nod to Cornelius and Zira’s son from Conquest and Battle) is a chimpanzee physically, but science run amok has sculpted his brain to be far more advanced and so he has an identity crisis of sorts. He can recognize injustice and he has a look in his eye that says he knows there is more that he does not yet understand. When he violently defends John Lithgow from the mean next-door neighbor the courts order James Franco put Caesar is a sanctuary for old apes. 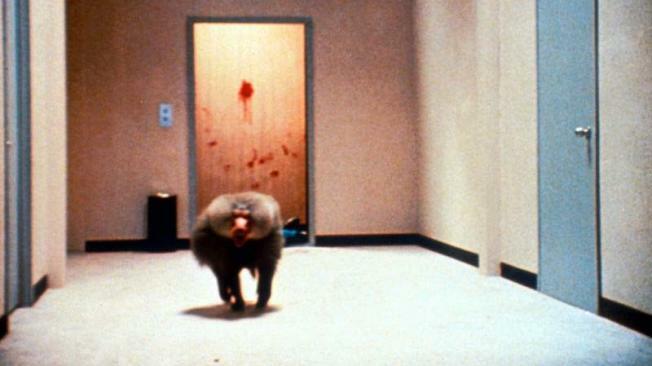 Once inside “monkey jail” the film really picks up. 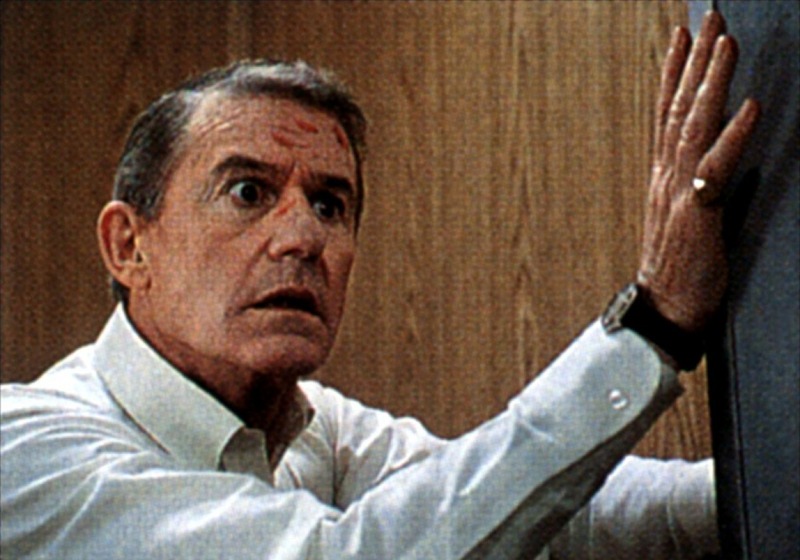 Up until now there have only been startling moments of realization and intrigue, here is where we get the lower primate retelling of Escape From Alcatraz, The Shawshank Redemption, and maybe Hunger. No longer protected by his human father, Caesar learns what it means to be an animal in a human’s world…also what it means to be an animal in an animal’s world. You feel his frustration and you really follow his logic and learning. If you know anything about this movie you know they stage a huge ape revolt. No room for passive resistance or nonviolent civil disobedience when your main thought is regarding your own feces and exactly where to throw it and how hard. I won’t spoil all the details, but I will say that it is this chapter of the film—where we really learn who Caesar is and who he can become—where it really soars. The revolt inevitably leads to action. The action is a lot of fun and I had a good time watching the dumb, dopey humans being consistently surprised by the wily ape strategies. My problem again was that all of the human characters are dumb, dopey cardboard cutouts, but it was enjoyable watching them get pummeled by Caesar’s army. The film ends well and I was surprised that I found myself actually hoping for a sequel. That almost never happens to me! I would like to see more of these apes in action. In addition to the splendid tale of science gone haywire and the subsequent ape revolution, there are several in-jokes and references for Planet of the Apes geeks. Caesar’s mother is called “Bright Eyes” by the scientists, which is the same name given to Taylor (Charlton Heston) by his ape captors in the first Planet of the Apes. 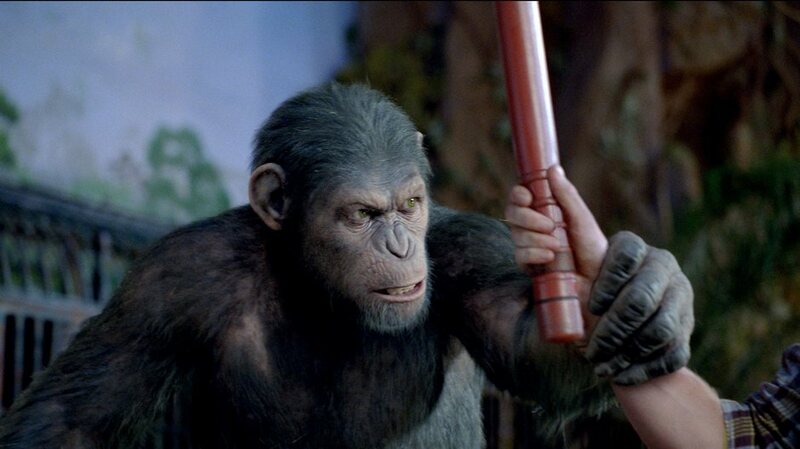 The name Caesar derives from Conquest of the Planet of the Apes. Mr. Malfoy’s character is named Dodge Landon (which I didn’t catch until the credits) and Dodge and Landon were the names of Taylor’s shipmates in the original movie. James Franco sort of plays a cross between the good human scientists in Conquest and Ricardo Montalban’s kindly circus proprietor from Conquest and Battle. To keep it pure, not just chimpanzees are present, but gorillas and orangutans as well. In possibly another nod to Montalban, one orangutan signs that he was from the circus. The humans have also named this orangutan Maurice which I presume to be a reference to Maurice Evans who played the dogmatic orangutan, Dr. Zaius, in the original 1968 film. Since he is a good orangutan I also take it as reference to Virgil in Battle for the Planet of the Apes. Also the gorilla in the movie is named Buck which is another reference to the original film because the gorilla named Julius was played by Buck Kartalian. Charlton Heston can be seen on the television a couple of times as well. One ape is referred to in passing by the name of Cornelia (the feminine form of Roddy McDowell’s chimpanzee character, Cornelius?). The lines, “It’s a mad house! A MAD HOUSE!” as well as “Take your stinking paws off me you damned dirty ape!” are both spoken. I’m sure there’s some I missed, but you get the idea and sometimes it’s good to know things were made by fans. Things are also kept safe for the Apes timeline because it depicts the original revolution and not the second one that was instigated by the now second Caesar (the offspring of Cornelius and Zira when they went back in time following the destruction of the earth in Beneath the Planet of the Apes). So Escape from the Planet of the Apes can still take place and set up the revised timeline where Lawgiver presides over both ape and man harmoniously and essentially undoing all of the previous and future movies. Don’t worry. I am sufficiently nerded out. I liked the movie quite a bit despite its many shortcomings. It’s not great, but it’s pretty darn satisfying. And you know what else? I have completed my mission. I have seen all seven Planet of the Apes movies now. If you loved the first movie with Charlton Heston and were let down by some of the sequels and remake then maybe this will give you hope. Apes ain’t dead yet.